FoodStyle Ltd. was established to manage and coordinate the activities of the company's interests in the hospitality industry. 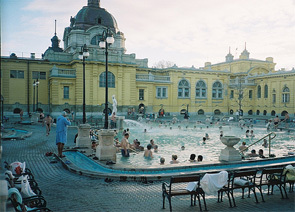 One of Budapest’s outmost heated garden premise in the patinated building of Széchenyi Bath. Trendy outdoor club at the paw of the Elisabeth Bridge. Private, elite men’s club in the patinated internal rooms of the Széchenyi Garden Restaurant. The Artesian bath, one of the City Park’s oldest buildings is being revived as a multifaceted unique resting point. Operation and renting out the catering units of the Széchenyi Spa. The Artesian bath, one of the City Park’s oldest buildings is being revived as a multifaceted unique resting point. Visit us with friends or family, by foot or by bike, let the City Park’s peculiar spirit and the friendly service take care of the stress. We won’t mind if you just come in for a quick drink, but don’t be surprised if the atmosphere makes you stay longer than planned. Use this form to send a message to us. The messaging, all fields are required. Personal information at the end of a simple control to answer questions, thereby facilitating the user's identity.